I find it hard to believe that any person/company could nail a stormtrooper costume down to one seen in any specific scene. There were loads of suits produced and probably all from the same molds, so how could one be so sure of it being "that suit"? Btw I'm not trying to start an argument, it's just one of those hard to prove claims that some make. It can be nailed down by the specific damage, scratches, painted details and trimming/flashing left. Iirc the rs suit had a three button ab plate which differentiates it from that specific suit and makes it one of the sandtrooper suits. However the belt IS the same as it is the only one seen with that holster mounted upside down. The other interesting thing is I sent RS a message a few months back with that picture iD'ing which I am possitive is their helmet. I never got a reply so I assume they don't care, but the damage., painted details and trimming of the left ear on their helmet match 100% to the helmet seen in the foreground. That's actually just a rumour that Andrew Ainsworth started, and has never been confirmed. Just to split hairs -- strictly speaking that piece of information comes from Matt "Trooper Expert" Gauthier. Back in the early 2000's before he had been banned from pretty much every forum on the interwebs he was describing one of the screen used helmets he'd had access to and noted that it was made from a flimsy cheap plastic kind of "similar" to what plastic milk containers are made from. Someone chimed in with the fact that plastic is called HDPE and the rumor mill did the rest. Keep in mind that at the time this information was something of a bombshell. Cause of the HDPE myth thing. I would say the most important letters in it are the "P" and the "E". As that's the major material. The nature of this material is hydrophobic. The main reason why the paint adhere so bad on that stuff. Also it would fit to the stuff which Ainsworth did in his shop at this time. As i also have now one of this helmet's out of this stuff in my collection, i can say that the cracking of the paint looks identical as to the screen used helmets. Also if the paint comes off, it comes off completly including the red primer which got used. That may could be a reason why you not see any red primer reamaining at the screen used helmets where the paint had comes off as well. The surface outside of the helmet is very smooth while the inside is more rough. I will not say that this PE "IS" the correct real material. But the colour matches perfectly as the characteristics. So if it's not the same it should be 99 % close. AHHH-HAHAHAHA! Oh no you d'int. 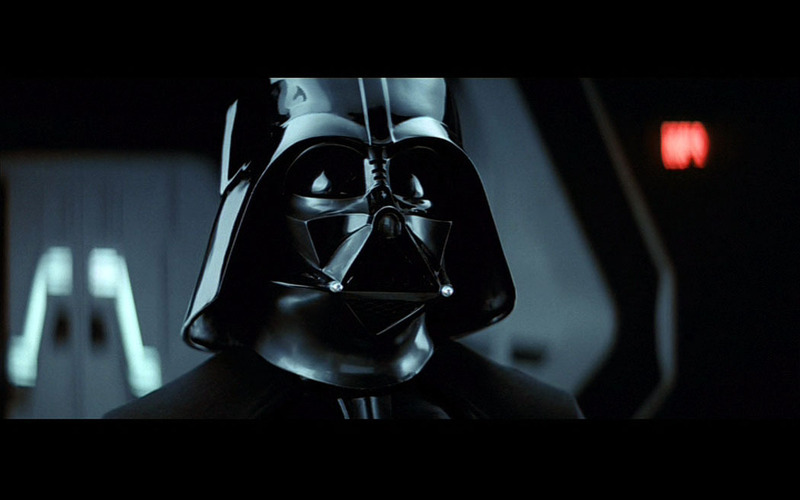 Edit: I should add, there is one distinct difference between a lower brow TK helmet and the low brow of the ANH Vader helmet. The TK helmet isn't hiding a distinguishing feature. 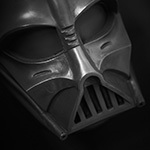 On the Vader helmet, the low helmet hides the eye brows - a helmet characteristic I personally prefer to see. ...I like that that little hint (high light) of detail. The high brow/low brow of the TK bucket doesn't hide anything. Why the original RS helmet was stripped? One of my all time favourite Vader images, I love ESB Vader. I still have them, but as i burend my fingers with those for one time, i consider to ask RS props.